The recipes presented here are tried and tested feel-good recipes that anyone can make; whether you’re stressing about revision or just looking to procrastinate with some cake then these are recommended for you. All the recipes here have been baked multiple times, so they work and taste great! N.B. Where it says butter, make sure you use butter. Margarine or baking butter such as Stork will not work in these recipes. This recipe is a no-bake, so quick and easy and very achievable to make in a student kitchen. This is a firm favourite with my family and friends and is requested every time I go home. 1. Stir all the base ingredients together. 3. Press the base mixture into this. Use a rolling pin to flatten out the surface. This will help the chocolate sit on the top of the base evenly. 4. Put all the topping mixture into a bowl and very carefully melt in the microwave. I’d advise putting your microwave onto a lower setting and then putting the time on for longer, as you’ll run less risk of burning the chocolate. 5. Once the chocolate is nearly all melted take it out and keep stirring; the residual heat of the bowl will help melt the remaining chocolate. 6. Pour the topping mixture onto the base and then place into the fridge to set. 7. Once set, cut into squares and enjoy! This recipe goes nicely with a cup of tea in the afternoon during a revision break. This is again a firm favourite, and it’s easy to get a soft, gooey centre to your cookies. 200g chocolate chips or M&Ms. 1. Preheat the oven to 190̊C. 2. Put the butter and sugar in a bowl and beat until creamy. The lighter the colour the more air and therefore the lighter the dough. 3. Beat in the vanilla and egg. I’d advise beating the egg separately before adding it to the mixture, to break the yolk up. 4. Sieve the baking powder, flour and salt, and fold into the dough. 5. Stir in the chocolate chips or whatever you choose as your filling. 6. Choose a large baking tray and make sure you line it to prevent the cookies sticking to the tray. 7. Using a teaspoon, place small mounds of mixture evenly spaced apart on a baking tray. Do not place these balls of dough too close together as while they cook they expand and will run into each other, so do bear that in mind. 8. Place the dough balls into the oven for 8-10 minutes, until the edges of the cookies are light brown and they are slightly soft in the centre. 9. Leave on the baking tray to cool before transferring to a cooling rack. If you try and move the cookies warm they will break. But don’t leave them to go cold on the baking tray otherwise they’ll stick, and you’ll end up with broken cookies. This is a family recipe passed down from my great grandma, so the measurements are imperial, not metric. You may need to do a conversion online. 1. Sift flour, ginger and baking powder into a bowl and stir together. 2. Place the butter in the bowl and coat with the flour. 3. Using the tips of your fingers, rub the butter in your fingers to break it up. Keep doing this until the mixture looks like breadcrumbs. Make sure the butter is soft but not too soft. 4. Mix the egg and sugar into the flour and butter. 6. Add the syrup to the mixture to make a soft dough. 7. Flour the kitchen worktop and knead the dough. 8. Roll the dough out so it is a couple of centimetres thick and use cookie cutters to cut the desired shapes. I know this is for gingerbread men, but if you wanted to make gingerbread hearts (etc.) that is also fine. 9. Place the dough pieces onto a lined baking tray and bake in the oven. My great granny did not leave a cooking time, but I’d recommend about 10-15 minutes. 10. Leave to cool before transferring to a cooling rack. 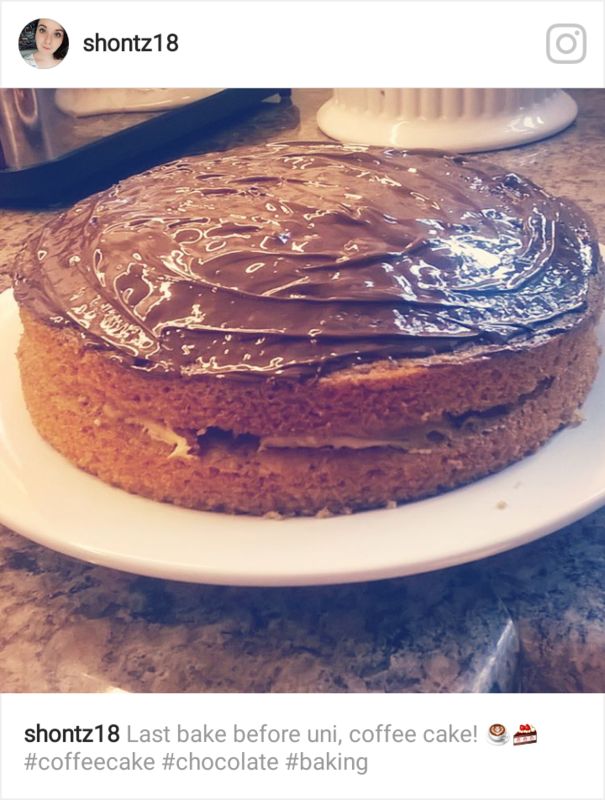 This is my dad’s favourite recipe and is probably the fiddliest one in this article and the most difficult to get right due to the making of the caramel. This recipe comes from the Good Housekeeping Baking Bible (which I swear by!). 1. Preheat the oven to 180̊C. 2. Put the flour, caster sugar and butter into a food processor and blend until the mixture forms crumbs, then pulse the mixture a little more until it blends into a ball. 3. Turn out the mixture onto a lightly floured surface and knead lightly to combine. 4. Press the mixture into a lined baking tin. 5. Bake the base in the oven to form the shortbread. Leave it for around 20 minutes or until the base is a very pale brown and firm to the touch. 6. To make the caramel topping, put the condensed milk, muscovado sugar and butter into a pan and cook over a medium heat, stirring constantly until it forms a fudge-like consistency. 7. Spoon the caramel over the shortbread, smooth over and leave to cool. 8. To finish the top, put the chocolate into a bowl and melt in the microwave. See the Peanut Butter Squares recipe for advice on melting. 9. Pour the chocolate over the caramel base and leave it to set before cutting the shortbread. 2. Blend the cocoa powder with 3tbsp of hot water to create a smooth paste. 3. Using a mixer, cream the butter and sugar together until light and fluffy. Stir through the cocoa-water mixture. 4. Add the beaten eggs one at a time. 5. Fold in the flour. 6. Split the mixture between two lined and buttered cake tins. 7. Cook these for about 20 minutes until well-risen and springy to the touch. 8. To make the chocolate buttercream, blend the cocoa powder and 3tbsp of hot water. 9. Add the butter and beat until light and fluffy. Gradually add in the icing sugar. 10. Add the cocoa powder. 11. Assemble the cake once the cake halves have cooled. Melt the chocolate before drizzling over the top.